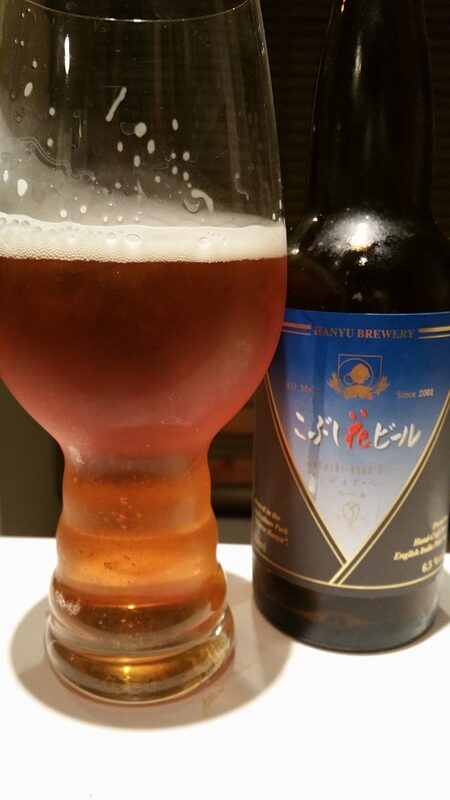 Kobushi Hana IPA is a 6.5% English style IPA by Hanyu Brewery out of Hanyu city in Saitama. Never heard of it before? Neither have we. We came across this beer purely by accident while on a recent trip to Coedo and it received a strong recommendation by the sales staff. The only description of Kobushi Hana IPA we have found is that it is an IPA with a high alcohol content. Helpful. Kobushi Hana IPA poured out a dark orange, almost brown colour, without any sediment or particles in the bottle so I am guessing it isn’t bottle conditioned. The main point, and also the most worrying, is that my nose has been finely tuned over the years to pick up hops in an IPA, yet I couldn’t smell any hops in this initially. I’ve been brain washed to the point where my nose can smell out an IPA from the opposite side of the bar. Where was the pungency? The citrus front? It wasn’t for lack of trying but if there were any nose to this then perhaps I had missed out on it. It was more malty than expected, almost becoming of a pale ale. The body of Kobushi Hana IPA was a touch better in that there was some citrus twang to it but I was worried that someone at the brewery had forgotten to add the hops to the mash. A persistent bitterness permeated through the beer that at least should there was some life in it. Kobushi Hana IPA is not the best example of an IPA and is more of a pale ale in my opinion. Kobushi Hana IPA was picked up at a local supermarket in Tsuruse, Saitama. It can also be bought online from Rakuten here at the time of writing. It has also been seen at World Beer Market here. It’s not necessary for IPAs to have citrus in the aroma. In fact, most English IPAs will be more earthy or even spicy, and much more muted overall. Even in the US, East Coast IPAs are known to have much less of that dank citrus character than the (sometimes overwhelming) West Coast versions. Thanks for the advice. It’s been a while since I’ve had an English IPA, with Greene King being the most recent example, albeit, not the best. Shall keep that mind when we come across some more.